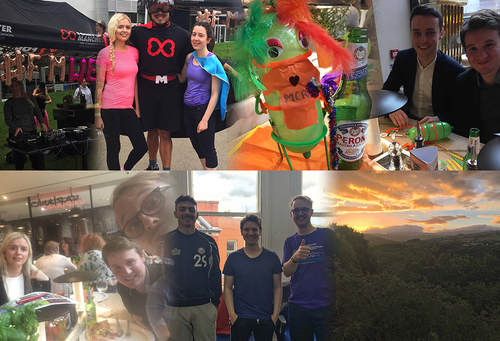 As part of Forever Manchester Week (2nd-11th June), Realm Recruit, based in Altrincham, took part in a variety of fundraising activities to show their support for Forever Manchester. From working out with Captain Manchester to designing and bringing to life their very own bee, Bee-am Gallagher, they had a fantastic time fundraising for ‘their favourite charity’ (despite finishing fifth in the Big Forever Manchester Quiz of the Year). Three of the more energetic members of the Realm team collectively walked more than 35 miles to work. Travelling from New Mills, Lymm and the city centre by foot to our Altrincham office, Duane, Chris and Joe walked for more than 11 hours before the start of the working day. Arriving at Realm HQ completely exhausted after their mammoth commutes, the trio helped to bring in the lion’s share of their fundraising total. All in all, the week was a resounding success with Realm raising a super £280 for Forever Manchester – anyone wishing to support the Realm Team can do so by making a donation on their Just Giving page. On behalf of everyone at Forever Manchester and the communities we support, we’d like to say a huge thank you to the Realm Recruit Team for their fundraising efforts.